The Memorandum of Understanding (MOU) between Australia and Cambodia raises important questions about Australia’s international legal obligations, the nature of regional refugee protection and resettlement. The agreement signed on Friday is unique. No other country in the developed world has signed an agreement with a developing nation for the resettlement of recognised refugees. The deal has been widely criticised by refugee law scholars, including David Manne of the Refugee Immigration legal Centre and Joyce Chia of the Kaldor Centre for International Refugee Law. Although Cambodia has signed the Refugee Convention, it has comparatively high levels of poverty, corrupt government and a poor human rights record. But does this mean resettlement of refugees there is unlawful? Does it constitute a breach of the central protection of the Refugee Convention and international human rights law, the non-refoulement principle? This principle provides that a refugee cannot be sent to a country where their life or freedom would be threatened. This could be because of their race, religion, nationality, political opinion or membership of a particular social group. International human rights law also provides that persons cannot be sent to a place where they would be subjected to torture or cruel, inhuman or degrading treatment or punishment, or where their life or liberty would be threatened. For several reasons, the resettlement deal may lead to a breach of the non-refoulement principle. Information on Cambodia suggests the resettled refugees may be at risk if they are unable to sustain themselves financially. Although the MOU indicates that funds will be provided to assist the refugees to become “self-sufficient”, the terms of this are vague. Further, Australian-funded settlement services include vocational training and loans for starting a small business. However, this will only be provided for 12 months after the refugee leaves temporary accommodation. It is uncertain, given the state of Cambodia’s economy, whether the refugees would be able to secure employment and sustain themselves at a basic level for the long term. Transfer to poverty may not, of itself, lead to a breach of non-refoulement. It may do so, though, if conditions are so bad that they drive the refugee back to their country of origin or if destitution leads them to be persecuted or seriously harmed. On this second point, the 2014 Human Rights Watch Report states that Cambodian authorities routinely detain homeless people, “street” children and people with disabilities in “correction centres” without due process. This indicates a risk that if refugees come to the attention of authorities after settlement services end due to severe poverty, they may become vulnerable to arbitrary detention. If they are Hazara from Afghanistan or visibly “different” from other citizens, they may be targeted for reasons of ethnicity or nationality. It is reasonably foreseeable, in light of recent protests in Cambodia, that certain sections of the populace will not welcome the refugees. 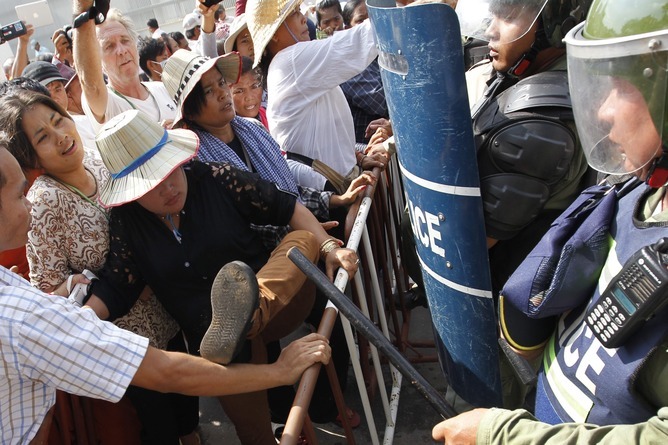 This may lead to refoulement if the evidence shows the refugees may be persecuted contrary to the Refugee Convention and the Cambodian government is unable or unwilling to protect them. Protests at the Australian embassy on the day of the signing suggest a significant number of Cambodians will not welcome refugees. Where does this leave a regional strategy? The deal raises wider political and legal questions as to how Australia should formulate regional refugee protection with our South-East Asian partners. Former judge Alaistair Nicholson says Australia should be looking at a “proper regional resettlement program for refugees throughout Asia”, not the sort of bilateral arrangements that we have settled with Cambodia and others. But what constitutes a proper resettlement program? As I have argued elsewhere, a well-developed multilateral regional agreement exists between countries in the European Union. It is underpinned by a strong regional human rights convention and court. This helps to ensure any transfers of asylum seekers do not breach fundamental rights. However, the political and legal dynamics of South-East Asia make developing such a regional framework here difficult. The process could take at least a decade. What can be done in the meantime to develop a regional refugee protection framework? The fact that Australia’s attempts at regionalisation have been carried out by bilateral agreements is not necessarily a problem. This can be a good starting point for regional cooperation. However, this should be done as a means of building the capacity of developing countries to accept and properly deal with refugees. Until that capacity exists, refugees should be resettled in Australia and not Cambodia. The United Nations High Commissioner for Refugees encourages resettlement as a “durable solution” to refugee flows. It must therefore be used so it gives refugees permanency and security. Given refugees are being transferred by Australia to Cambodia for resettlement and not merely for processing, a “durable solution” requires successful integration and compliance with fundamental human rights.